Tired of PUBG's Erangal, Miramar, Sanhok maps? 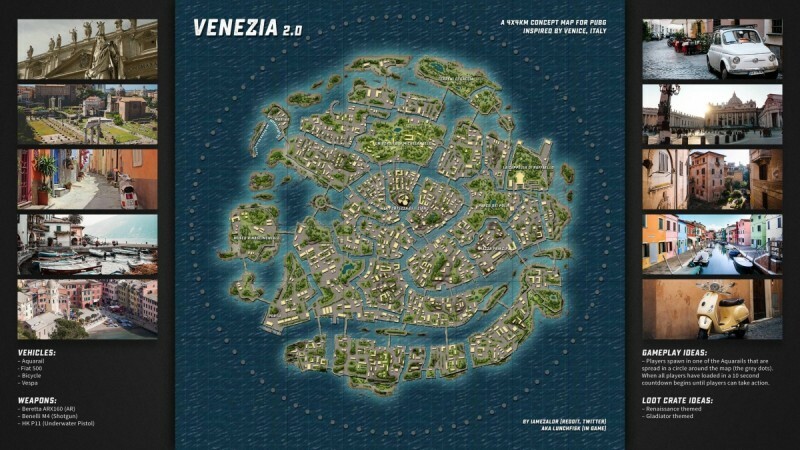 All-new Venezia map with underwater pistol and more could bring your interest back. PlayerUnknown's Battleground (PUBG) has garnered global attention, especially on mobile. With new features, weapons, outfits and maps, PUBG developers have managed to keep players engaged in the gameplay. But if you're growing tired of everything that's currently present in the popular battle royale game, PUBG might think of something new or something that has been in the concept phase. Redditor IamEzalor, concept map creator of PUBG's winter map, showed off a new concept map based on Venice, Italy, landscapes and named it Venezia. While the concept map was shared on IamEzalor's official Reddit account several months ago, reports are starting to suggest that PUBG might eventually bring this map to the game. Since Venezia draws inspiration from the popular tourist destination, which is known for its small islands, canals and bridges, the concept map also features a similar outlook. But playing in such a map won't be a child's play. IamEzalor has listed some interesting game-play ideas for the Venezia map, which could change everything for PUBG players. The concept map underwent some major changes and the final concept comes with new vehicles, weapons and more. As anyone could see from the map layout, there's a lot of water and IamEzalor has the perfect idea to utilise it. Instead of simply swimming or ferrying around water bodies, which is currently the case in Erangal, Venezia could start an underwater battle with the introduction of HK P11 underwater pistol. Although the original Venezia map had UAV surveillance drone in red zone area, a C4 crate-exclusive item, and a lot of bridges, the revised version comes without those. The concept map includes a new AR rifle, named Beretta ARX160, Benelli M4 shotgun, new aquarails denoted by gray dots around the map, new bicycle and a Vespa. IamEzaler also imagines new loot crate ideas to adopt Renaissance and Gladiator themes. With all these changes and an interesting map design, PUBG could definitely bring back some charm to its PC and Xbox versions and to mobile sometime in the future as well. Nothing is official until PUBG comes out and says it out loud, so let's just keep our fingers crossed.